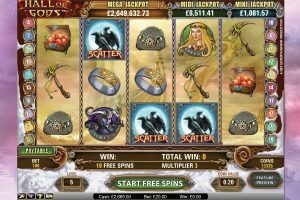 Over the years, NetEnt, one of the world’s leading software developers of digital gaming solutions and online casino games, has provided many lucky players the ideal opportunity to win life altering jackpots on their online progressive slot, Hall of Gods. 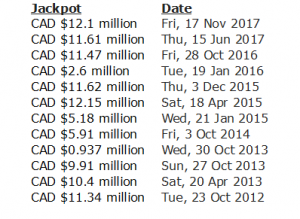 Closing out 2017 with a Hall of Gods payout of a monster CAD $12.1 million win on 20 November, NetEnt finalised their online progressive payouts for 2017 with CAD$ 115 million paid out in jackpots for the 12 months of the calendar year. CAD $12.15 million – Anonymous Winner – 18 April 2015. CAD $12.1 million – Neil, Aberdeen, Scotland – 17 November 2017. CAD $11.85 million – Anonymous Winner – 08 February 2012. CAD $11.62 million – Anonymous Winner – 03 December 2015. CAD $11.61 million – Anonymous Winner, Norway – 15 June 2017. CAD $11.47 million – Anonymous Winner – 28 October 2016. As you can see, the big money has been won 3 times in the past 15 months. 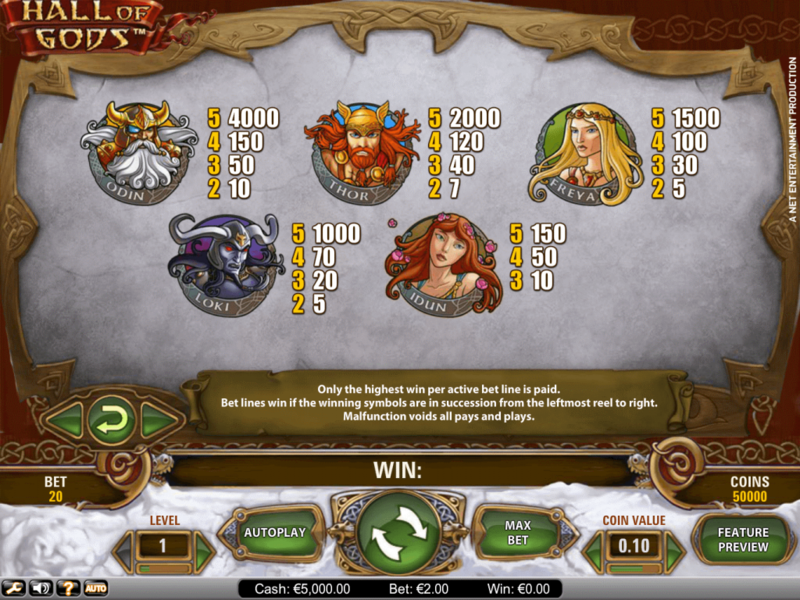 More people are playing Hall of Gods and the progressive jackpot is growing larger faster. At the time of writing, Hall of Gods Jackpot is standing at a little of CAD $8 million. It literally could go off at any time. NetEnt range of online progressive slots offers some of the online casino industry’s largest global online jackpots. With this latest mega-jackpot win in November 2017, Hall of Gods saw its second mega jackpot in less than six months, after a Norwegian player celebrated a multi-million dollar win a mere five months previously in June 2017. The mobile play of Hall of Gods Touch is now identical to desktop versions. Through NetEnt Touch technology, equivalent game rules, identical game play and payout percentages and high-quality HD and 3D graphics and animations are available on mobile devices. As the Touch name implies, games can be played smoothly with the touch screen of your device. As Online Casino Smartphone use now comprises approximately 46% of the Canadian online casino market, NetEnt has become THE industry leader in the development of mobile platforms for gaming. All new release NetEnt games including Hall of Gods are designed for mobile play, and are fully-compatible with Apple iOS and all Android operating systems for smartphone and tablet use. If you have an average broadband speed or better, Hall of Gods and Hall of Gods Touch are available to play directly online in HTML5 format without any need to download any software. 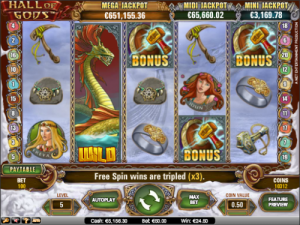 There are two main reasons for this larger jackpot. June to November of course, is a longer than usual period between jackpot wins and since the last big win, Hall of Gods profile has soared. 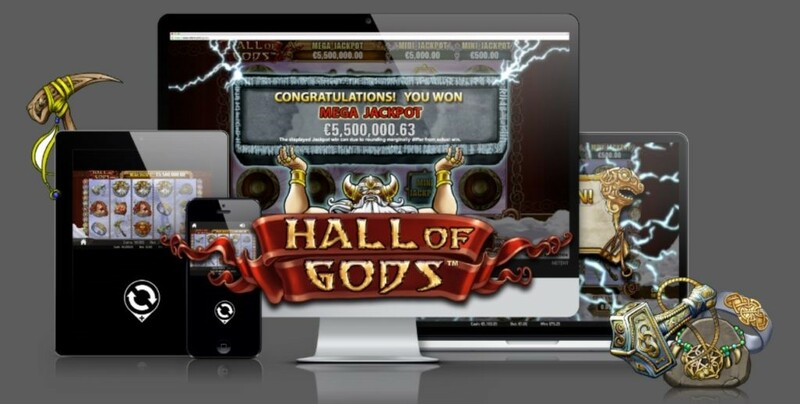 It’s becoming almost an essential for an Online Casino to include Hall of Gods in their list of online games. More and more of the best and most reputable online casinos are looking to include Hall of Gods in their game line-up including some of the latest additions in William Hill Casino and Karamba Casino. 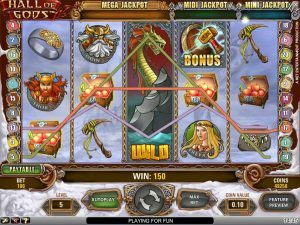 How often is Hall of Gods jackpot won? On average over a 365-day period since Hall of Gods’ introduction, the Progressive Jackpot has been won once every 168 days. Whilst you never can truly know for sure when the jackpot is going to be hit, online slot players who enjoys playing in a strategic way generally keep a track of time gone by since the last big win and use it to determine when to next sit down to play Hall of Gods. Naturally, betting more and larger amounts increases your chances of hitting one of the three jackpots. However, every spin, no matter how small and seemingly insignificant, is eligible for the enormous payouts on offer. If you are bold and brave enough to face its Nordic God inhabitants, the Hall of Gods can be a truly life-changing, multi-million dollar winning experience. Try it out for yourself today at William Hill Casino and Karamba Casino.